Asia and the Pacific is witnessing the world’s fastest urbanization in history. In the period 2000-2025, 1.1 billion people are projected to migrate into Asian cities and the region is now home to more than half of the megacities worldwide. Providing quality jobs, housing, urban infrastructure and public services for these new urban migrants and supporting sustainable development of the region’s large metropolitan areas would be a significant fiscal challenge for many governments. The current approach of revenue mobilization for cities and municipal fiscal reform efforts are unlikely to meet the substantial financing needs. Instead, there is a need for a metropolitan public financing strategy that is integrated into national urban development plans and matches national development objectives. The governance arrangements in metropolitan areas would be critical for such strategies to succeed. Compared to fragmented governance structures, the area-wide metropolitan governance model, which allows for effective coordination of service provision and revenue mobilization in the broad metropolitan areas, offer the most promising prospects. When the jurisdiction boundary is large enough, public service delivery can have better coverage and be more efficient, more revenue productive tax bases would become available, debt repayment capacity can be enhanced, and fiscal disparities can be reduced. While these changes may come at a cost of diminished local government control in some countries, reforms towards area-wide metropolitan governments would be a step in the right direction. 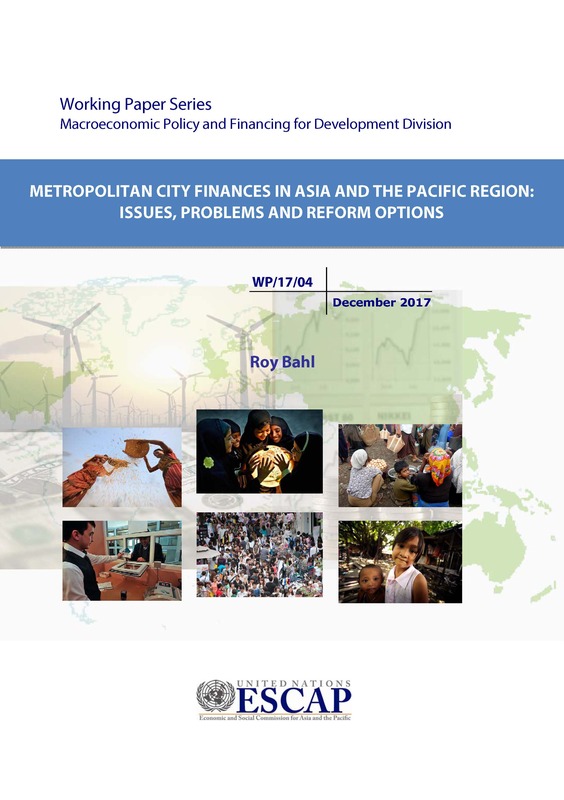 Financing Asia-Pacific’s big cities also requires a broad mix of revenue tools for metropolitan governments, including property and land taxes, transport or fuel taxes, user charges, and broad-based local business, sales and consumption taxes, or surcharges on national taxes. In many cases, the availability and efficiency of these revenue tools depend on the extent of local fiscal autonomy. Accordingly, the intergovernmental transfer schemes should be rationalized in such context. Three central elements for a successful metropolitan public finance strategy can be highlighted. First, there is no universal solution, and policy choices should be aligned with local policy objectives. Second, where local fiscal autonomy is deemed important, local governments should be provided with adequate space for revenue mobilization. However, at the same time, they should be constrained from accessing intergovernmental transfer and special subsidy regimes. Third, higher level governments might consider establishing a commission to study the feasibility of a special regime for metropolitan area finances.